When we think about fireworks, we often think about how the booming noises they produce affect our dogs letting them startle or even develop sheer panic, however, not much thought is given when the festivity is over and things seem to get quieter. After a day of being kept safely in the home away from all the noises and commotion, many dogs are eager to go outside and return to their sniffing and urine marking routine. However, not all risks are over. Many dogs may find spent fireworks attractive and may decide to chew on them or even ingest them which can cause problems because fireworks are toxic to dogs. 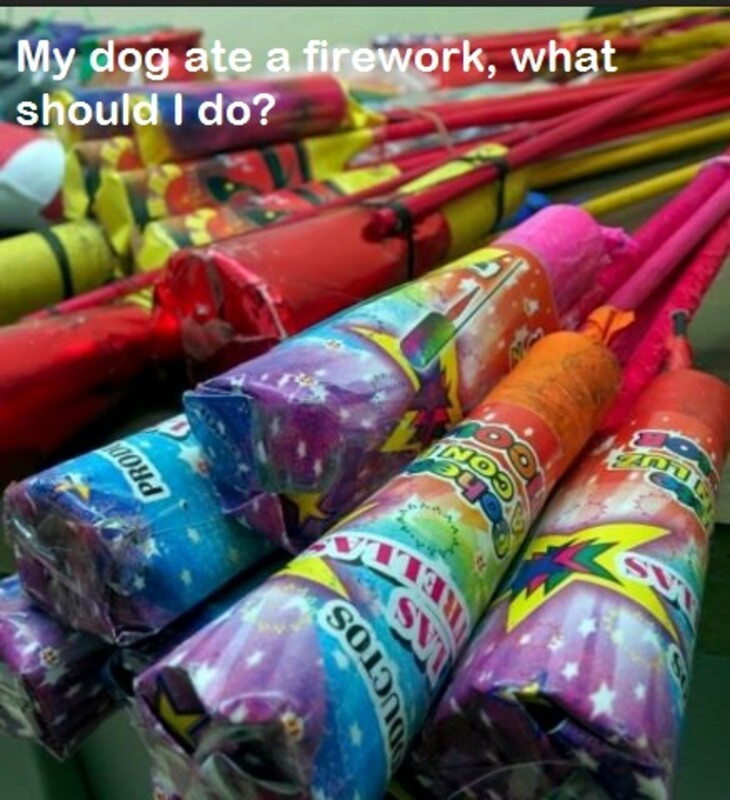 Many dog owners become concerned about their dogs eating fireworks, are they right to be concerned? The answer is yes. According to the Pet Poison Helpline, fireworks can be dangerous to our canine companions in many ways. Other than the loud noises produced and risks of direct exposure to fireworks, which can cause serious burns, unlit and spent fireworks contain harmful chemicals such as potassium nitrate, sulfur, carbon, cadmium, barium and coloring agents that may contain heavy metals such as mercury, antimony, copper strontium and phosphorus. When a dog ingests fireworks, their nitrate contents can cause blood changes and anemia when ingested in a reasonably high quantity, explains a veterinarian Dr. Jen. On top of that, gunpowder can irritate the stomach and intestinal tract, causing vomiting and diarrhea as a minimum. Other symptoms according to the Pet Poison Helpline, may include weakness, tremors, seizures, trouble breathing, acute kidney failure, bone marrow changes and yellowing of the skin (jaundice). If you suspect your dog has ingested fireworks, call your vet immediately. If your dog ingested them within the last couple of hours, there are chances that, based on the type ingested, your vet or the pet poison helpline can provide over-the-phone instructions on how to induce vomiting using 3 percent hydrogen peroxide (all dog owners should keep this always handy for such instances). If more than a couple of hours have passed though, dogs may need to get supportive care, fluids and medications from the vet. For very mild cases with minimal ingestion that are affecting only the digestive tract, there are chances your vet can suggest home treatment. The vet may recommend a bland diet consisting of a large meal of mashed potatoes, sweet potatoes, or pumpkin, explains Dr. Pollen, a retired holistic veterinarian. These foods are easy to digest and help move the ingested toxin through the dog’s system. However, in significant cases, home treatment is inadequate and your dog may need to be hospitalized and treated with IV fluids and medications, further warns Dr. Pollen. Depending on the type of firework ingested, as in the case of those with heavy metals, dogs may require a specific antidote, warn Pet Place Veterinarians. While many dogs recover with supportive care, the prognosis can be critical for dogs that swallow a large amount or have delayed treatment. As seen, fireworks can be a hazard whether before or after being lit up. For those lightening them up, it would be great if they would be considerate and dispose of their firework remnants with safety in mind. 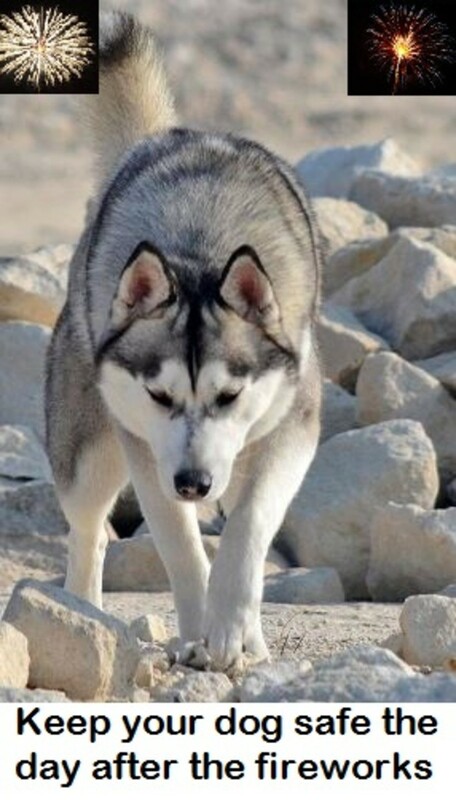 Since we don’t live in a perfect world though, dog owners must keep their dogs on leash and monitor their activities to keep their companions safe from exposure to any toxic residues.